Detective Sam Carver journeys through sins scattered across the City of Angels, where hipsters, homeless, immigrants, producers, politicians, movie stars, and cops collide in mysterious ways. Every move Carver makes is anticipated by the killer, Dylan Cross. She has hacked his computer and knows his diaries and secrets. She sees in him a kindred and damaged spirit, a man who can understand her crimes, heal her scars, and love her. Dylan is reclaiming herself from a past of brutal injustices inflicted by a world of misogyny and power. Detective Carver is dealing with his own troubled history -- an elusive and violent father. 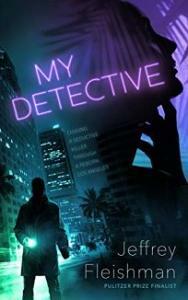 "Jeffrey Fleishman is a career storyteller... His third novel, “My Detective,” is his first foray into crime fiction, as well as his first book set in Los Angeles — in the land of Raymond Chandler, this is not a coincidence... Fleishman’s hero is Sam Carver, a homicide detective in the hard-boiled tradition: smart, brave, dogged, and haunted by plenty of demons... But “My Detective” isn’t just a hero’s tale. Half of the novel is in Sam’s point of view; the rest of it belongs to the killer, a woman named Dylan Cross. The two leads alternate chapters, speaking in first person and present tense... The thrill is in learning her motives and in seeing her lead her dance with Sam... “My Detective” is the first of a trilogy featuring Sam Carver."